A few people have commented that these are “too lemon-y”. If something being too lemon-y is a foreign concept to you, make these! They are indeed very tart, but the cream tempers the tartness somewhat. 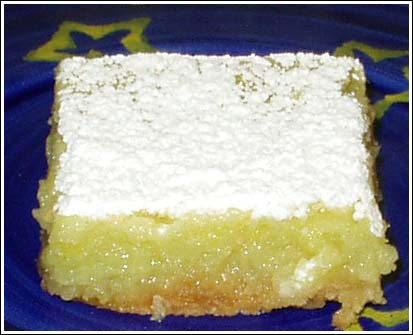 A good recipe for basic lemon bars. Shortbread Base: Don't preheat oven yet. Line a 9 x 9-inch square baking dish with foil, Release foil or parchment, extending paper over edges of pan. Spray with cooking spray if using regular foil. In a food processor, combine the flour, cornstarch, granulated sugar, salt and ground cinnamon. Pulse briefly until blended. Add the butter and pulse until the dough forms moist crumbs and sticks together when pinched, about 1 minute. Press the dough into the bottom and 1/2 inch up the sides of the prepared baking dish. Refrigerate for 30 minutes. Alternatively, you can skip the food processor and just cut all the ingredients together with a pastry cutter. Food processor makes it much easier. Preheat oven to 350 degrees F. and bake the base until pale golden, 20 to 22 minutes. Filling: Reduce oven temperature to 325°F. In a medium mixing bowl, whisk together the granulated sugar, flour, salt and lemon zest. Add the eggs, lemon juice and cream and whisk until just blended. Carefully pour mixture over the warm base. Bake until filling feels firm when touched lightly, about 20-22 minutes. Transfer pan to wire rack; cool to room temperature. Chill for 2 hours before cutting into squares or bars. Store bars in an airtight container in refrigerator for up to one week. For the best flavor, remove from refrigerator and serve at room temperature. Do not freeze. not that i was asked, but if you really have a thing for lemon bars (which oh my god do i) you van get a similar taste just by placing some crumbled shortbread into a very small ramekin or something, topping with some lemon curd of choice, and tossing in a toaster oven for a couple of minutes, or using a sponge cake shell….or if you want to try something different a few slices of sugar free angelfood cake, with lemon curd, on a panini grill is, while not something ive tried yet, none the less intend to. spring was invented for lemons..
Yum. I made these yesterday and they are wonderful!! Very lemony but very good! They were very lemony, but I still really liked them. Todd thought these were too lemony. The cream probably would have tempered the lemon a bit.